Hushpuppy (Quvenzhané Wallis) is a young girl who lives with (or at least near) her father (Dwight Henry) as part of an island community known as The Bathtub. This band of outsiders live on the other side of the levees in Louisiana, where they eke out a meagre existence fishing for catfish and crabs. It's a hardscrabble life, but one which is largely free of most of the concerns of the modern world, with most days ending in drunken celebrations full of laughter and singing. As seen through the eyes of Hushpuppy, it's a life filled with quiet moments of magic and wonder, and even though she doesn't know where her mother is and her father has a tendency to disappear for days at a time, she seems happy with her open, strange childhood. This idyll starts to crumble when events conspire to destroy most everything that Hushpuppy knows. After being missing for a few days, her father returns dressed in a blue medical gown and with a hospital tag around his wrist. Then, after the two get into a fight which ends with him collapsing, the skies themselves open and a terrible storm floods The Bathtub. 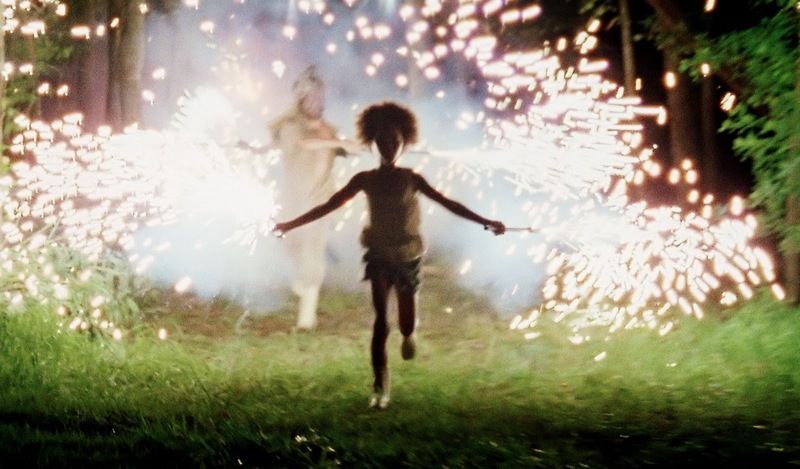 Faced with these two cataclysmic events, Hushpuppy is forced to come to terms with her place in the Universe, and what it would mean if her father was no longer a part of it. The most striking thing about Beasts of the Southern Wild - apart from an utterly astonishing central performance from the, at the time, six years old Quvenzhané Wallis - is the way in which it blends the real and the fantastical. Hushpuppy's life in The Bathtub is one of grime and filth; her house is covered in dirt and junk; the fish that the locals catch are photographed in slimy, unnerving close-ups; and there is a real sense that the denizens of The Bathtub are living outside of normal society. At the same time, there are moments like the aforementioned flood which seem almost Biblical in their scale and awe, and Zeitlin's floating camera finds beauty in the interplay between light and detritus, and in the juxtaposition between the personal crises that afflict Hushpuppy and the apocalyptic scale of the events surrounding her. There's also a very strong element of magical realism built into the heart of the film. Whilst most of the story focuses on the attempts of Hushpuppy and co. to restore The Bathtub, and how this naturally leads to conflict with the Government they prefer to live without, it frequently cuts to scenes of extinct creatures known as Aurochs. These are giant cow-pigs which Hushpuppy first learns about in a lesson given by the local teacher/shaman, and which she is told will one day return to the Earth in order to once more chase and devour people. The Aurochs are first seen frozen under the Arctic, but thaw out just as Hushpuppy's father collapses, after which they begin to beat a long, destructive path towards her. The Aurochs are a strange, terrifying illustration of Hushpuppy's fears about the future as conjured up by through her half-formed, naive understanding of the world. They come to represent everything that dark, weird and unknowable about existence, and the worse things get in her life, the more violent the Aurochs become and the closer they get to her. It's an audacious trick that could seem wildly out of place given how concerned the rest of the film is with dirt and slime, but it works wonderfully. This is partly due to the design of the creatures, which are as dusty as anything else in the story, partly due to the elegant structure of the screenplay, which brings the two strands together at the perfect emotional moment for the story, and partly due to the by turns haunting and celebratory score by Zeitlin and Dan Romer, which perfectly captures the fairytale tone of Hushpuppy's experiences. Mostly, though, it's down to Quvenzhané Wallis. It really cannot be said enough: this young girl gives a truly unforgettable performance. By turns fragile and resilient, playful and terrified, she grounds even the most outrageous moment in the film - the aforementioned scene in which the reality and fantasy collide - with tremendous spirit and determination. It's a raw, unvarnished turn that lacks any of the self-consciousness found in most child performers, and it perfectly conveys the light and considerable darkness of Hushpuppy's life and journey. The rest of the cast are very good, too - Dwight Henry is terrific at making an angry, tempestuous man seem sympathetic - but it is Quvenzhané Wallis' world, they just live in it. Beasts of the Southern Wild is by no means a perfect film; the opening half an hour, with its combination of voiceover and floating camerawork, comes across as Terrence Malick for Beginners, and Zeitlin's attempts to capture the flavour of life in The Bathtub grows repetitive very quickly, especially when the script falls back on spouting vaguely philosophical phrases which are all too often trite. It also veers dangerously close to glorifying abject poverty at times, and at others seeming to exploit it in a way which could be viewed as an exercise in minstrelsy. However, once the storm hits and the Aurochs thaw, it starts to become something much more startling, an emotional, exhilarating tale that rejoices in the sheer act of being alive. Watching it, it's heartening to think that people will always know that once there was a Hushpuppy, and she lived with her daddy in The Bathtub.